This invaluable addition to Springer's Explorations of Educational Purpose series is a revelatory ethnographic account of the visual material culture of contemporary youths in North America. 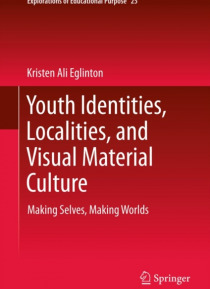 The author's detailed study follows apparently dissimilar groups (black and Latino/a in a New York City after-school club, and white and Indigenous in a small Canadian community) as they inflect their nascent … identities with a sophisticated sense of visual material culture in today's globalized world. It provides detailed proof of how much ethnography can add to what we know about young people's development, in addition to its potential as a model to explore new and significant avenues in pedagogy. Supported by a wealth of ethnographic evidence, the analysis tracks its subjects' responses to strikingly diverse material ranging from autobiographical accounts by rap artists to the built environment. It shows how young people from the world's cultural epicenter, just like their counterparts in the sub-Arctic, construct racial, geographic and gender identities in ways that are subtly responsive to what they see around them, blending localized characteristics with more widely shared visual references that are now universally accessible through the Web. The work makes a persuasive case that youthful engagement with visual material culture is a relational and productive activity that is simultaneously local and global, at once constrained and enhanced by geography, and possesses a potent and life-affirming authenticity. Densely interwoven with young people's perspectives, the author's account sets out an innovative and interdisciplinary conceptual framework affording fresh insights into how today's youth assimilate what they perceive to be significant.Supported by a wealth of ethnographic evidence, the analysis tracks its subjects' responses to strikingly diverse material ranging from autobiographical accounts by rap artists to the built environment. It shows how young people from the world's cultural epicenter, just like their counterparts in the sub-Arctic, construct racial, geographic and gender identities in ways that are subtly responsive to what they see around them, blending localized characteristics with more widely shared visual references that are now universally accessible through the Web. The work makes a persuasive case that youthful engagement with visual material culture is a relational and productive activity that is simultaneously local and global, at once constrained and enhanced by geography, and possesses a potent and life-affirming authenticity. Densely interwoven with young people's perspectives, the author's account sets out an innovative and interdisciplinary conceptual framework affording fresh insights into how today's youth assimilate what they perceive to be significant.Supported by a wealth of ethnographic evidence, the analysis tracks its subjects' responses to strikingly diverse material ranging from autobiographical accounts by rap artists to the built environment. It shows how young people from the world's cultural epicenter, just like their counterparts in the sub-Arctic, construct racial, geographic and gender identities in ways that are subtly responsive to what they see around them, blending localized characteristics with more widely shared visual references that are now universally accessible through the Web. The work makes a persuasive case that youthful engagement with visual material culture is a relational and productive activity that is simultaneously local and global, at once constrained and enhanced by geography, and possesses a potent and life-affirming authenticity. Densely interwoven with young people's perspectives, the author's account sets out an innovative and interdisciplinary conceptual framework affording fresh insights into how today's youth assimilate what they perceive to be significant.